Tuesday, May 23 | 5:45 to 6:00 p.m. Governor Hickenlooper will be making a brief stop in Lyons, on Tuesday, May 23, as part of an 11-day bill signing tour. Hickenlooper chose six Colorado Main Street Communities to visit on the tour: Leadville, Central City, Trinidad, Woodland Park, Wellington, and Lyons. The governor is scheduled to be in Lyons between 5:45 and 6:00 p.m. on Tuesday, where he’ll say a few words on the success of Lyons’ Main Street Program, and take a quick tour downtown. Please join us in welcoming Governor Hickenlooper to Lyons! New Date & Time: Wednesday, May 24, beginning at 6:00 p.m.
Due to inclement weather forecast, the DR.BOP Draft Concept Plan Meeting and Site Tours have been rescheduled for Wednesday, May 24, beginning at 6 p.m. (previously scheduled for May 18). Please join the planning and design team as they share the concept plan for future use of the Deed Restricted Buy-Out Properties (DR.BOP) at the St. Vrain River Confluence. A shared vision has been developed with input from neighbors, community members, Boards and Commissions, Town staff, and other stakeholders. The phased concept plan reflects the values, insights, and desires expressed through community workshops and outreach. It is intended to serve as a blueprint for final design that captures all feedback, builds on inherent opportunities, and allows for public use and enjoyment of these sites. This meeting will be held at LaVern Johnson Park, weather permitting. If inclement weather occurs, the meeting will be held in the Town Hall Board Room and notice will be sent. Check out the plan, talk with the design team, and give us your thoughts. Following lengthy discussion at the May 15 Board of Trustees meeting, the Board motioned to continue the second reading of the Planet Bluegrass Farm Annexation to a special meeting, scheduled for Thursday, June 8, beginning at 6:00 p.m. The mayor and board heard considerable feedback from community members during Monday's public hearing. At this time, public comment will not be accepted for the Planet Bluegrass Farm Annexation reading on June 8; the public hearings for these items were held on May 15, 2017. If passed at the June 8 meeting, the special election will be held later this summer, as required for annexations of five or more acres (Town land excluded). All registered voters within the Town of Lyons will receive mail-in ballots for special elections. 4th Avenue, from Main Street to Broadway, will be closed to all through traffic on Saturday, May 20, from 7:30 a.m. to noon. The RTD lot off 4th Ave. will be reserved for the Estes Park Car Club, as the first location of their historic tour guide. Volunteer for Burning Can at Lyons Outdoor Games! The Lyons Outdoor Games is a volunteer-driven event, with deep tradition in community involvement. This event couldn't happen without the team of volunteers! 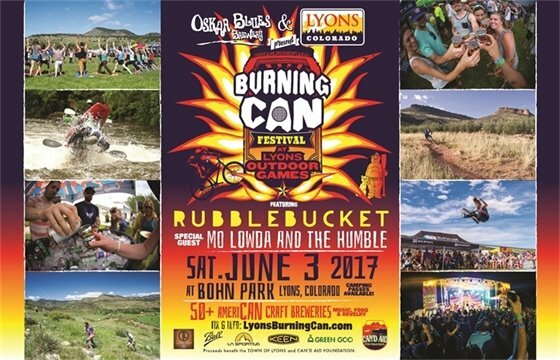 Sign up for the 2017 Burning Can at Lyons Outdoor Games, the premier Colorado outdoor lifestyle, adventure sport and music festival (and beer fest)! There are plenty of volunteer slots to fill, with each shift averaging around 3 hours per shift. Don't be afraid to sign up for more than one shift for the event if you can manage! Without the volunteers, this event wouldn't be possible!